Join a couple of bows with lace, string of beads or ribbons. (Image courtesy of Angelic Pretty). Accessories can make or break your outfit. They come in handy when you don’t have any idea what to wear and would want to throw in just anything you grab from your closet. Accessories also break the monotony of an outfit in one color; they add “personality” to your outfit. However, too many accessories can also make you look worse than when you don’t wear any accessory. The trick in wearing accessories is to keep a balance between style and comfort, as well as to make your accessories complement your outfit, not contradict it. It sure is difficult to look for accessories, especially if you want something stylish and fun at the same time. If you live in Japan, you’re lucky since there are a lot of cute Japanese fashion accessories everywhere. If you don’t know where to get your accessories, the best thing to do is to make your own Japanese-inspired ones. Make your own cute socks by sewing lace and bows to the top. (Image courtesy of Angelic Pretty). Before embarking on your project, you must first be familiar with cute Japanese fashion. There are a lot of websites that can help you know what to do and what cute accessories are in style. You just have to look for cute Japanese fashion accessories and there would surely be tons of pictures and websites that would come up. 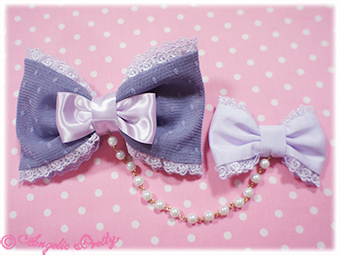 Start by checking out Angelic Pretty for some inspiration. When you are planning to make your own accessories, you must also consider your comfort and your style. Not everyone can pull off an edgy style or a cute style, so you better stick to your personal preferences and start from there. There are a lot of craft stores that you can visit, where you can find the materials that you’ll need. Wires and chains are a bit difficult to work on, unless you are a professional, so for starters, you better stick to beads, ribbons, laces and leather. You can also work with glitters, felt and fabric, depending on what you want to make. You can never go wrong with cute printed fabric. You can turn them into a scarf, a headband, or a bow. You can even braid strands of fabric together to make some braided bracelets. If you want something more edgy, look for studs and spikes. You can glue these studs and spikes on a strip of leather to make your own leather cuff. The possibilities are endless, and all you have to do is be resourceful and creative. With a little bit of patience and lots of creativity and imagination, you can have your very own collection of cute Japanese fashion accessories.